Amber and Mark were married at one of our favorite wedding locations, the World of Aloha Estate, a lush property overlooking the Kahaluu Fishpond on the windward side of the island. 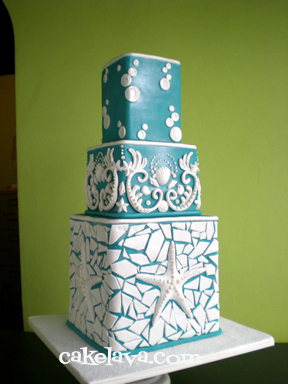 Rick designed a striking squares wedding cake which incorporated starfish and seashells used throughout their wedding. When we saw Amber and Mark's wedding colors, Rick suggested a blue fondant cake with white accents and they loved the idea. Each tier had a different design on it with handmade items placed onto the cake. On the bottom tier, he went for a mosaic tile effect and a single giant starfish. There was a lot of subtle detailing on the cake that is difficult to see in the photo. This cake was delivered immediately after Stanley Chang's Primary Election party cake and we arrived during the couple's cocktail hour, just in time to see Amber looking gorgeous and she gave us a huge smile. She was so happy with her cake! We really enjoyed working with Amber and Mark throughout the design process and wish them both the best as husband and wife! 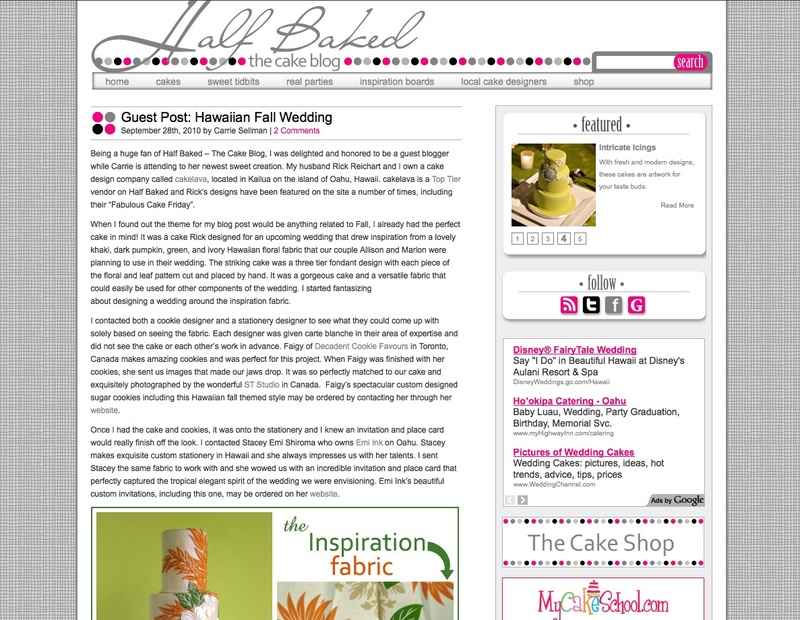 Today I had the wonderful opportunity to be a guest blogger on one of Rick's and my favorite blogs, "Half Baked - The Cake Blog". 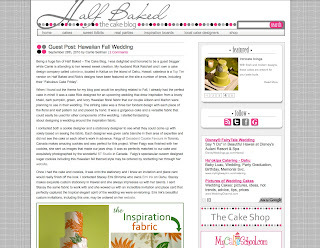 cakelava is a Top Tier vendor on Half Baked and has been featured several times on the blog, including their "Fabulous Cake Fridays". Carrie Sellman, the owner of Half Baked gave birth to a baby girl last week and recruited a number of people to blog on her behalf. I ecstatically accepted the challenge to blog. 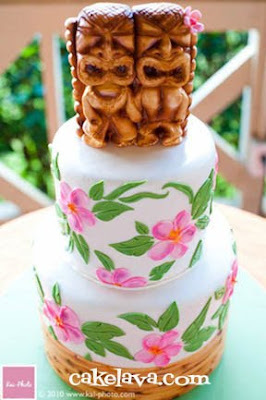 There is an interesting story behind Allison and Marlon's wedding cake, shown above, which you can read about in my guest post today, "Hawaiian Fall Wedding". 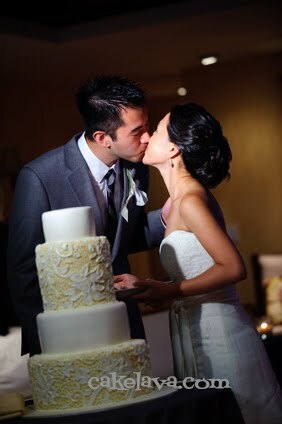 Allison and Marlon, who reside in San Francisco were married on August 9, 2010 (8-9-10). They were a super sweet couple and so easy to work with. They gave us a beautiful fabric piece to use as inspiration, which you will read about on Half Baked. 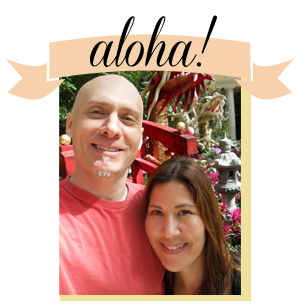 Also recruited for my guest blog feature was two top notch vendors who would help me create a Hawaiian Fall Wedding inspiration board. Faigy from Decadent Cookie Favours in Toronto, Canada created the amazing cookies that perfectly matched the cake and Stacey from Emi Ink, located here on Oahu created beautiful custom invitations and guest cards for the blog. Working with Faigy and Stacey was such a pleasure and I have been looking forward to our blog post ever since! As you'll learn in the post, neither Faigy or Stacey saw the cake in advance. They strictly worked off the same fabric piece we did. Many, many thanks to Faigy, Stacey and Carrie, and of course Rick, for sharing their incredible talents with me, for a very good cause! For anyone interested in getting their hands on these incredible cookies or the paperie, please contact Decadent Cookie Favours or Emi Ink directly. 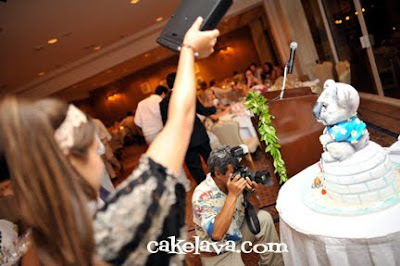 Next Featured Wedding - Melissa and Polar - The Cake! 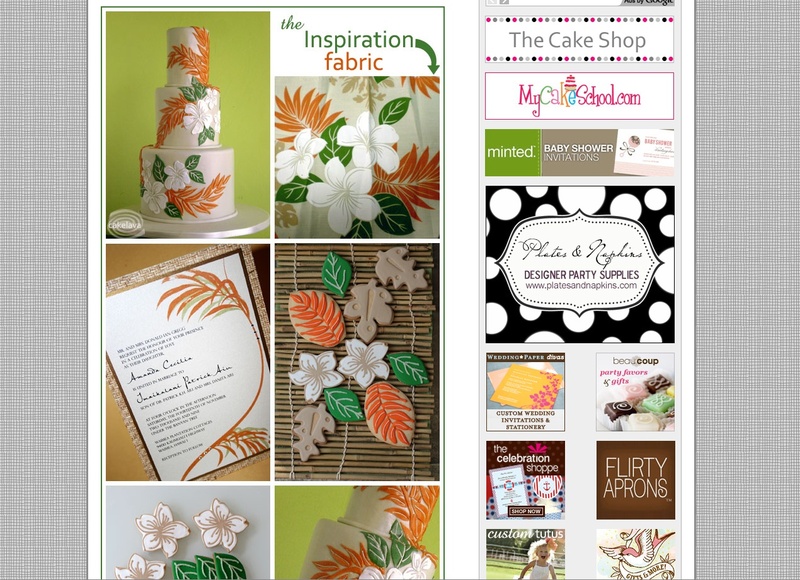 Choosing our next Featured Wedding was a piece of cake! Melissa and Polar were selected as a Featured Wedding couple for cakelava.com the minute we walked into the Ocean Front Oasis at the Oasis World Estates. We saw the beautiful colors -- sumptuous yellows, ivories, dark grey and greens -- combined with decor which perfectly suited their location, an ocean front paradise with dark wood and Indonesian accents throughout. We were greeted warmly by Alia of Parasol Events, the couple's wedding coordinator, Justin of Oasis World Estates, and Mike and Jon of VISIONARI who shot the stunning images shown here. Gorgeous florals and luxe linens were provided by the always fabulous Yvonne Design, and guests dined on mouth watering cuisine provided by Christian and his staff at Cater to Me. 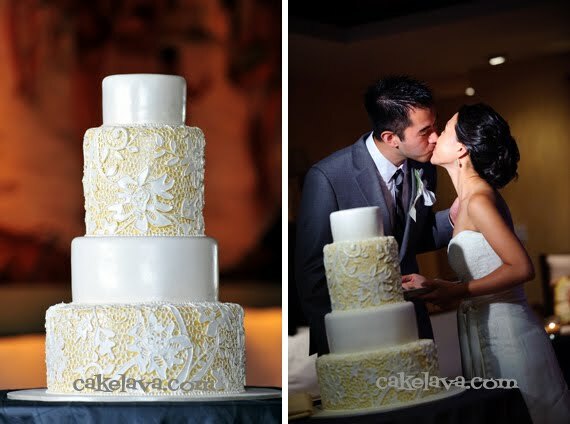 We had been excited about Melissa and Polar's amazing wedding cake since Rick designed it. 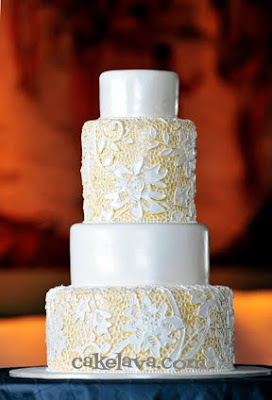 The cake was inspired by a pattern the couple provided to us from their invitation that had a yellow colored underlay. The making of their four tier fondant wedding cake with the lace overlay was a time consuming process of painstaking detail. Rick made the entire pattern freehand, and the texture on it was incredible in person! During the cake delivery, we were spotted by our sweet couple, Melissa and Polar who came over to us swooning about their cake. We were so happy and wanted them to love their cake! The cake was a huge hit, not just with the couple and their guests but also caught the attention of Cake Central Magazine, who we had been in contact around that time for cakes for another issue. The magazine loved the cake and said it would be published in their September issue. We were ecstatic! 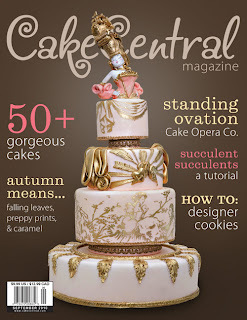 We were proud of Melissa and Polar's cake and wanted to be able to share it but instead secretly tucked it away until Cake Central Magazine was released. We recently got our issue and also have uploaded images from Melissa and Polar's wedding on cakelava.com so people can see what the rest of their wedding looked like. 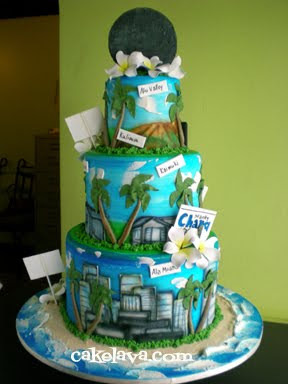 In case you are wondering, the cake was all real and on the inside was our Hawaii Five-0 and Kona Toffee Crunch flavors. Congratulations to Melissa and Polar on their wedding, their Featured Wedding, and for having their cake in Cake Central Magazine! Over the weekend Hawaii held it's primary election. One of the candidates we were watching closely was Stanley Chang, who was running for Honolulu City Council District 4, which spans a good part of Oahu ranging from Ala Moana and Waikiki, Diamond Head, Kaimuki, Kahala, Aina Haina, Niu Valley, Hawaii Kai, and more! Rick and I became familiar with Stanley Chang through our client Rebecca who is an enthusiastic member of "Team Stanley" and worked on his campaign. We've made cakes for Rebecca before and each time she always gives Rick a lot of creative freedom and Stanley's cake was no different. She gave us some background information on Stanley Chang, along with his website, votestanleychang.com . We knew the districts he served and that they encompassed a huge amount of Oahu and then Rick had the challenge of figuring out how best to represent the district, Hawaii and Stanley Chang specifically. If you've ever been to Hawaii during election time, you'll recall that the candidates hit the streets with their campaign signs and wave to cars during the morning and evening rush hour commute. Everyone does this, including the mayoral and gubernatorial candidates. It's part of the "Aloha spirit" and has been that way for years. 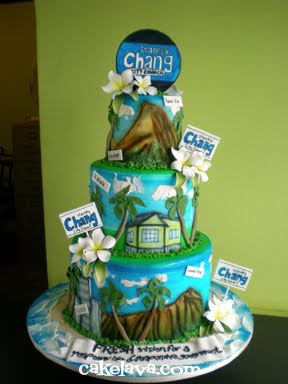 Since the sign waving is a big part of any political campaign in Hawaii we had planned to include "Stanley Chang" signs on the cake throughout his districts. On the cake, District 4 was represented amongst the three tiers. On the bottom tier was Ala Moana, Waikiki and Diamond Head, which was represented by the famous Diamond Head crater and lot of high-rise buildings found throughout Waikiki. The second tier was more of the residential areas as shown by the artwork of the houses. On the top tier was Koko Head Crater, found on the southeast side of Oahu, and represents the Hawaii Kai, Niu Valley and Kuliouou areas. At the base of the cake was Stanley Chang's motto: "Fresh vision for a responsible and responsive government". 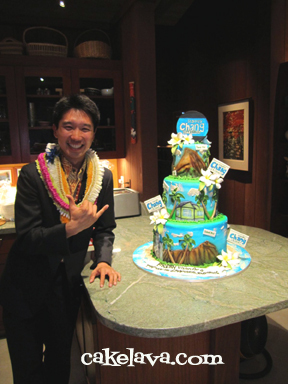 The cake looked amazing in person, full of color and it screamed "Hawaii!" and we hoped "Victory!" as well. 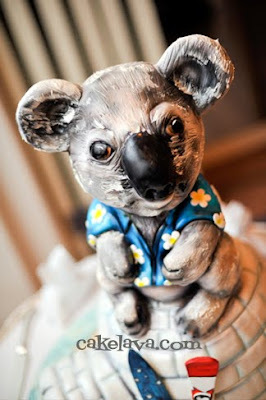 On Saturday, September 4th, we delivered our first sculpted koala sitting on an igloo cake for Adrienne and Nathan's wedding. 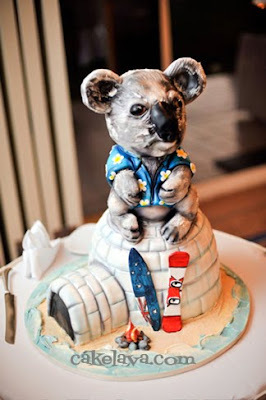 The story behind the Koala and Igloo wedding cake is an interesting one. 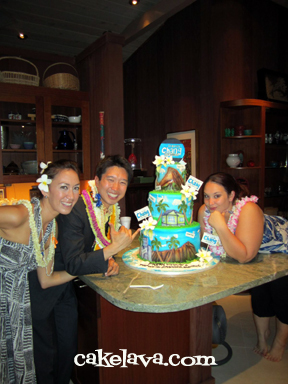 Adrienne is from Canada and Nathan is from Australia and they requested to have a cake that represented both places and honored the merging of the two in at their Hawaiian wedding. The cake design went through phases. Originally, Adrienne and Nathan approached us with the idea of having a cake split down the middle with one side being Australia and the other Canada. For Canada they wanted the emphasis to be on snow and winter and for Australia it would be more about summer, the beach and surfing. They thought maybe the bride could be a racoon on skis or another Canadian animal and the groom, a Kangaroo on a surfboard. Then it evolved to a traditional bride and groom on skis and surfboard. Adrienne and Nathan compiled a list of Canadian winter and Australia summer items for us to consider and then left the design up to Rick. They said they were completely open to the design as long as it was fun and memorable. 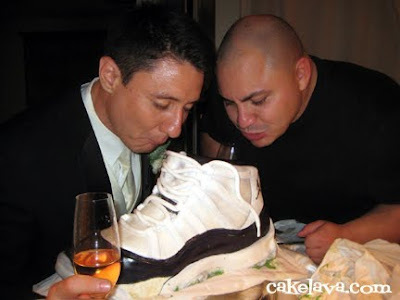 Prior to Rick designing their wedding cake, none of us were expecting a sculpted cake. We thought it was going to be a more traditional shape with fun elements of both Canada and Australia. I remember when Rick sat down to design their cake. He really had no idea exactly what he was going to do. 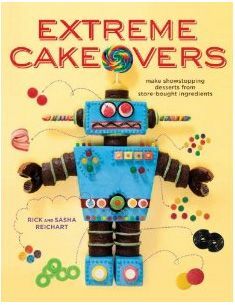 He looked at their list of items and began thinking how best to integrate the two places in a way that wasn't overpowering to the size of the cake and give them the impact they were looking for. He spent a good amount of time thinking about their cake and when he showed me the sketch I saw the cutest koala bear sitting on an igloo, wearing a shirt with the Canadian maple leaf (which was later changed to an Aloha shirt). He had an Australian flag surfboard and a Canadian flag snowboard leaning up against the igloo and a campfire going. He put a beach around the igloo tying everything together. It was absolutely adorable! I thought it was brilliant and so cute and we both had our fingers crossed Adrienne and Nathan would feel the same way. It turns out the couple loved it and were so excited about surprising their guests with such an unusual cake! The images below were expertly shot by Dave Miyamoto & Company photography. Thank you to Dave for sharing the images with us! Adrienne and Nathan looked extremely happy with their cake! 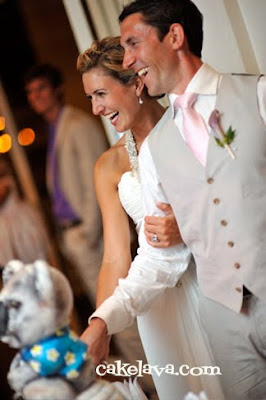 We love that we had a chance to relive some of the moments of their wedding though the images. Fantastic!! Congratulations to Adrienne and Nathan! 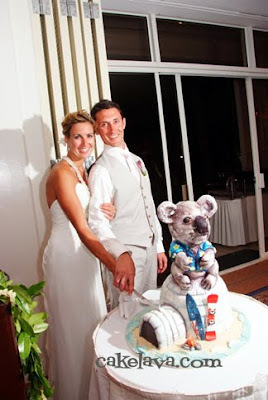 The beautiful bride and her groom and their koala on an igloo wedding cake! Is this is a happy couple or what! 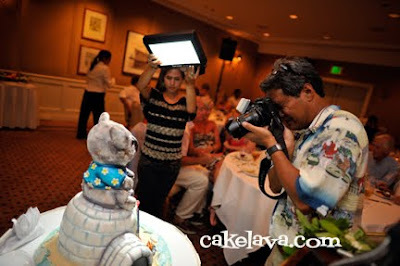 Dave and Claire Miyamoto setting up the perfect shots of the cake! What I would have given to have a cake as cute as this when I was growing up and dancing ballet. 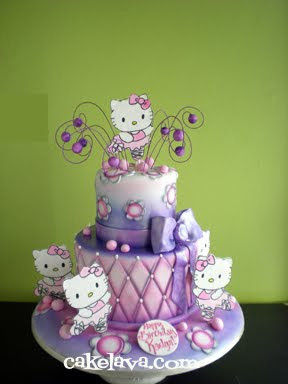 One Hello Kitty ballerina is super cute and to have them dancing all around the cake is over the top adorable! Rick worked his magic on this pink and purple birthday cake for Kaelyn, giving her dancing kitties, a big beautiful bow, flowers, swirlies, diamonds, all the things that little girls (and us big girls) love. Our client's requests were to "please use pink" and to make it fun and cute. Mission accomplished! 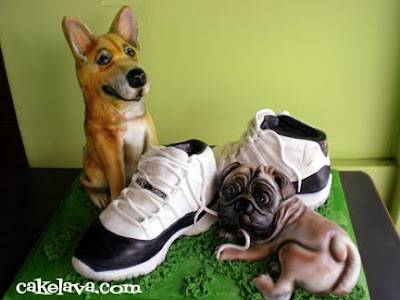 We love this cake! In the past few weeks something quite magical has happened over at cakelava. We have been blessed with the opportunity on several occasions to to help a very special child celebrate their birthday. Each of the children have unique medical circumstances in their lives that they have been dealing with, but something they all share is that they or a loved one, has been affected by Cancer. One of our sweet recipients of a beautiful cake was Haley (shown below), who was given a party to celebrate the end of more than a year of chemotherapy and radiation treatments for an aggressive brain tumor. Haley's story touched our heart when our client Judy contacted us. We were nearly booked with events on the weekend of the party but we knew we had to make this happen for her. Once we started discussing the cake with Judy, and heard more about her story and saw a photo of "Haley the Brave" the 6-year old captured both of our hearts. After feeling tremendously sad that any person, much less a 6-year old should have to deal with such an experience, I looked at her sweet smile and we were determined to give her a cake that would make her grin from ear to ear on her special day! We quickly learned that Haley loved cats and dogs, and flowers. 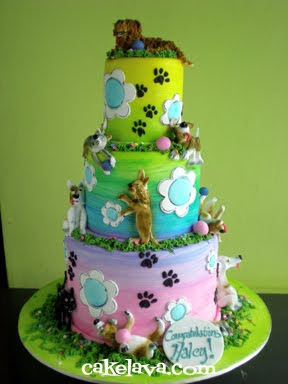 The cake would be cheerful with playful dogs and cats and full of color, and include "Lovey" her pet Labradoodle who would be given a prominent position on the cake. 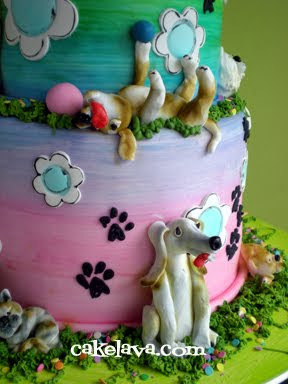 Rick handcrafted little dogs and cats and placed them hanging all over the cake, looking like they were intoxicated with happiness. When Judy saw the cake her eyes lit up. 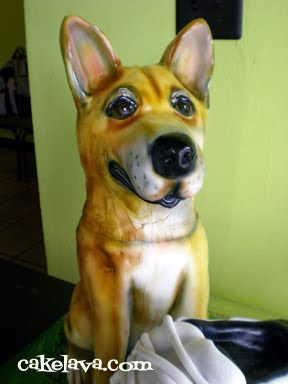 She said that Haley is going to LOVE the cake and would instantly recognize "Lovey" her dog. We were later told that the cake was a huge hit with Haley, her family and guests of the party. The kids went crazy for the little critters and the accompanying "balls" on the cake. Haley found a hidden hyena on the cake that made her laugh and laugh, she thought all the animals were so cute. She gave special attention to Lovey and took him off to save him for the future. We're reminded daily through words and big smiles why we do what we do. We are honored to be able to make even a small difference in the life of a little girl who has been through so much. Thank you to Haley and Judy, for giving us the opportunity! One of our stops on our recent trip to Orlando was the LEGO store and if you haven't experienced one, they are a real treat! We were trying as much as possible to keep work to a minimum on our trip, but knowing we had a LEGO themed cake on the books for nearly a year, we couldn't help but think about the design as we roamed through the store. 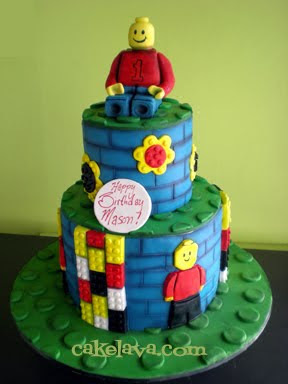 Being in the environment proved to be creatively inspiring and over the weekend we helped Mason celebrate his birthday with a cute and colorful LEGO themed design. Rick has made cakes for this client's other children and she happily placed the entire design in his hands. What a sweet cake this was, from the individual lego pieces to the handcrafted lego people on top and around the cake. We can't help but smile when we look at it! Hopefully it put a big grin on Mason's face too! 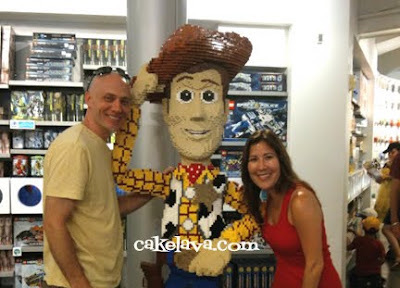 Photographed at the Orlando LEGO store.We couldn't resist a photo op with Toy Story's "Woody" who was made entirely out of LEGO's! Lilia and Alex are one of those couples vendors love to work with. They are easygoing, super sweet, have great taste and feel comfortable leaving the details to the designers. They were married in August at the lush outdoor Moli'i Gardens venue at Kualoa Ranch with Dianna from Hawaii Weddings and Events coordinating their special day. Their reception location is very close to where the TV show LOST used to film and is completely surrounded by spectacular lush greenery. It was the perfect location for a couple with a tropical Hawaiian theme. 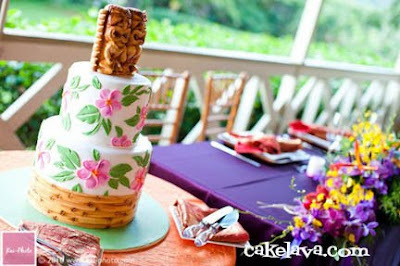 Rick designed Lilia and Alex's wedding cake with their Hawaiian theme in mind. 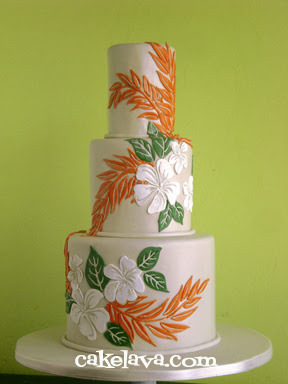 They requested Hawaiian plumeria flowers to be used in the design as well as a custom tiki couple. Rick made the tiki couple by hand -- it looked so realistic and the detail on it was incredible! The couple chose our Banana Nutella and Strawberries Chantilly flavors for their guests, many of which came from the mainland for the occasion. Congratulations to Lilia and Alex! Thank you to Dianna and Kai Photo for the lovely images! 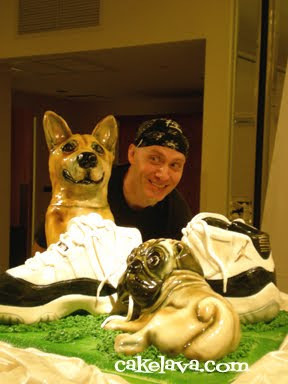 Shortly after our plane hit the runway at Honolulu International Airport after an 8 day trip to Florida, we went from vacation mode to work mode and immediately started thinking about the doggies and shoes cake. 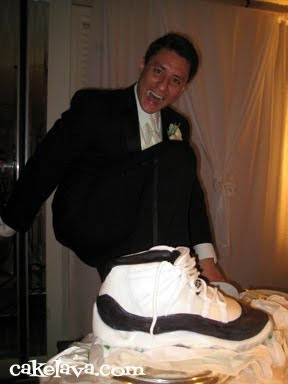 Hours after we entered our shop on our first day back at work, our bride Lauren, whose wedding was last weekend, came bearing a gift, a pair of brand new very collectable retro styling Nike Air Jordan XI Concord sneakers for Rick to use as a model for her wedding cake. It wasn't exactly a "wedding cake" as we might think of one, there were no tiers to stack, no flowers, and it was completely a surprise to the groom, who thought he was having a black and white cake with roses. Boy was he in for a surprise! Lauren called this a "groom's cake", but we thought of it more as a wedding cake because it represented both the bride and groom's lives. Barnaby is a sneaker fanatic and Lauren adores her dogs, a Shiba Inu and a Pug. Rick spent the better part of his birthday last week working on this cake, as it was comprised of four separate sculpted cakes that were married together on a single board. It was gigantic, or as he likes to say, ginormous and Rick had to nearly clear his plate to make this cake on our first weekend back to work. This is not the kind of cake to just ease into after being away. It took a lot of planning and measuring and cake and time -- about 18 hours of working on it! All four sculpted pieces are cake, no cereal treats were used. Lauren's dogs are absolutely adorable and we fell in love with them over the days they took over our kitchen. She explained to us that the pug was the playful, mischievous one and wanted him to interact with the sneakers and the Shiba Inu is a very sweet dog and wanted their personalities to be conveyed. When we arrived on site with her cake, there was a swarm of staff from the hotel, including the Pastry Chef who came over to check out the cake. Suddenly everyone pulled out their cell phones and started snapping photos of the cake, including us. It had its own paparazzi. 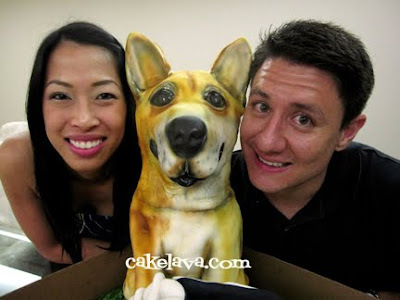 We were thrilled with how the cake turned out and so were the bride and groom, who tells us even the doggies vet, who attended the wedding instantly recognized her pets. We'd like to say a special thank you to Lauren and Barnaby who shared their photos with us. Enjoy! Having way too much fun at their wedding! Unsure where they should make the first cut, Lauren and Barnaby go for the pug's backside. If the shoe fits, compare it! They boxed up their doggie to take home. Family portrait with the newlyweds! Calling all sports fans! 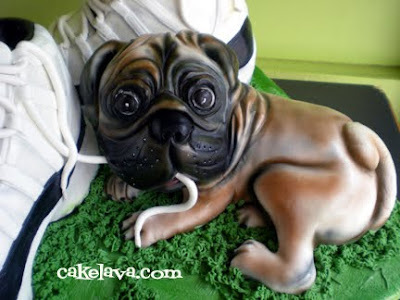 We promised there would be more sports cakes on the blog. Tuesday was devoted to softball, today is football, and tomorrow's cake is well ... pretty unusual, but does have a basketball influence. That's all we can say about it. You'll just have to see it. 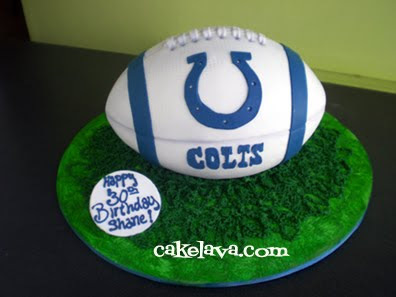 The cake above was made for a 30th birthday party for a man who loves, you guessed it, the Indianapolis Colts. Rick had the idea of making the football white and blue rather than the regulation colors and our client was excited about it. This cake took a little research. We're not exactly huge football fans or are we too familiar with the Indianapolis Colts, however, like everyday in cakeland, it's a learning experience and we were happy to add the Colts to our portoflio of football cakes, which is building every year!